A Florida woman is facing a child cruelty charge for allegedly using her teenage son as a hood ornament on her Mazda, police report. 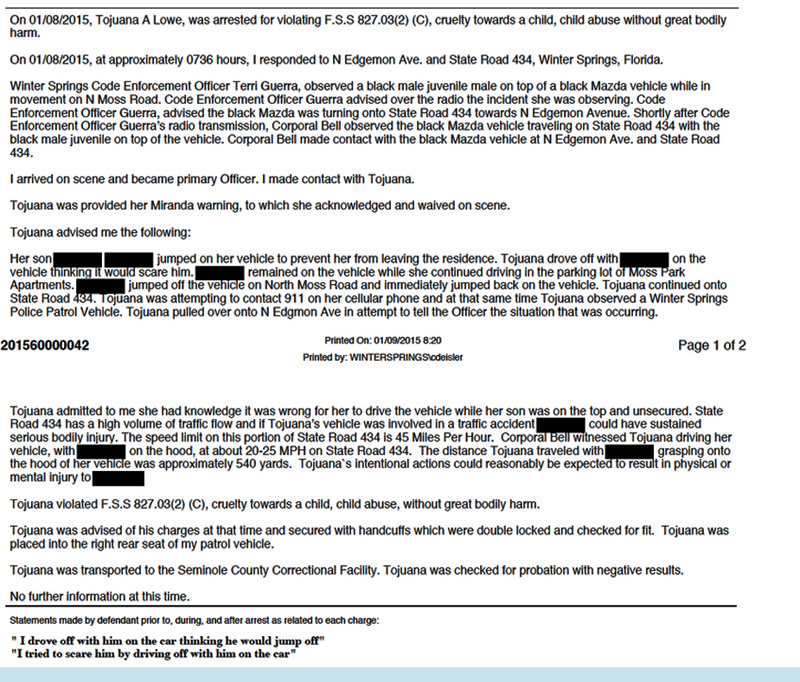 Tojuana Lowe, 43, was arrested Thursday morning after being spotted driving on State Road 434 near her Winter Springs home with her son “on top of the vehicle,” according to a police report. Police estimate that Lowe, driving between 20 and 25 miles per hour, went about 540 yards with her child “grasping onto the hood of her vehicle.” Cops added that the state road has a “high volume of traffic flow,” and that if Lowe had gotten into an accident, her son could have been seriously injured. Lowe “admitted to me she had knowledge it was wrong for her to drive the vehicle while her son was on the top and unsecured,” a cop reported. Charged with felony child cruelty, Lowe was booked into the Seminole County jail, from which she was later released after posting $2000 bond. She is scheduled for a February 25 arraignment in Circuit Court.